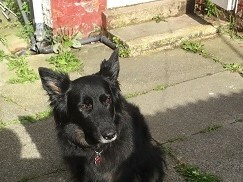 Kia is a 5 year old who is described as loyal, loving and obedient. She has been in this household for 3 years and they have tried to work on her training and general socialisation. In the home she is a fantastic girl and very easy to be around, outside however she still hasnt learnt how to behave around other dogs and she can create and stress - however if she regularly sees the dog and gets to know them Kia is fine and happy to walk quietly. Therefore going forward someone with patience and time to continue the socialisation would be beneficial for Kia, as she also has another little habit of nipping when she gets stressed. All in all a lovely girl who just needs an experienced home to work on Kia's anxiety outside the home, our volunteer thought she was a lovely dog. Kia is used to going to the groomers, travelling in the car. Kia is currently being left long hours and owner feels Kia needs more company and someone who can give her more attention and maybe her outside behaviour is due to being left and no longer in a routine?